Performers showcase their native tongues at Bear Creek Park Pavilion. In honor of International Mother Language Day, KPU’s Department of Language and Cultures put together a showcase of music and poetry featuring performers from all five of the department’s represented languages. The event was held at the pavilion at Bear Creek Park on Saturday Feb 11 from 2:30 to 4:40pm, and was open to everybody free of charge. “The point is to bring members of the community together and celebrate the variety of languages and mother tongues that we have in this area,” says KPU language professor and event organiser Paivi Koskinen. International Mother Language Day is a worldwide celebration of multiculturalism and world languages that was founded in 1999. The Department of Language and Cultures celebrates Mother Language Day as a way to promote pride in Metro Vancouver’s linguistic diversity. “We think it’s really important to encourage all immigrants who come to the area to maintain their native languages because we feel that a mother language is an important part of your identity and who you are,” says Koskinen. The Department of Languages and Cultures’ theme for their Mother Language Day events changes from year to year. Last year, the department opted to showcase the indigenous languages of the various First Nations communities around the Lower Mainland, while this year, they decided to feature the languages offered by the department at KPU—French, Japanese, Mandarin, Punjabi, and Spanish. Koskinen says that the event was the product of six months of hard work by the department. Much of that time was spent finding performers from around the community to represent the five languages taught by the Department of Languages and Cultures. 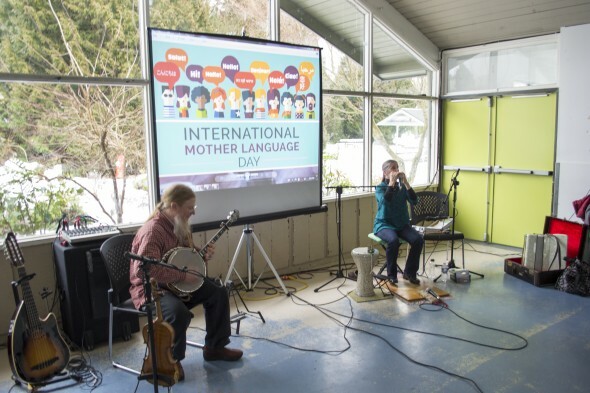 While the event has been held at KPU’s Surrey campus in the past, the department decided with last year’s Mother Language Day to start hosting it at Bear Creek Park to be “closer to the community” and to take advantage the park’s free parking facilities. The event was MC’d by KPU student Nuvjit Sidhho. While the Department of Languages and Cultures had planned for a Punjabi segment, unfortunately Harman Ranvijay, who was to perform traditional Punjabi folk music, had to cancel on short notice. After some words by department chair Olivier Clarinval, the event opened with traditional Japanese music performed by Kenji Seino and Haruka Kato of the Vancouver Mikoshi Sakurakai Society, along with members of the KPU Japan Club. Next up was Juliana Fiallo, who read Mexican poetry from various eras of Mexican history. After that was Mingzhu Lu, who lead the room in singing traditional Mandarin songs. Finally, the event concluded with French-Canadian music by professional folk music duo Vazzy. Planning is already underway for next years’ Mother Language Day Celebration and the Department of Language and Cultures encourages the KPU community to stay tuned for what it has in store.